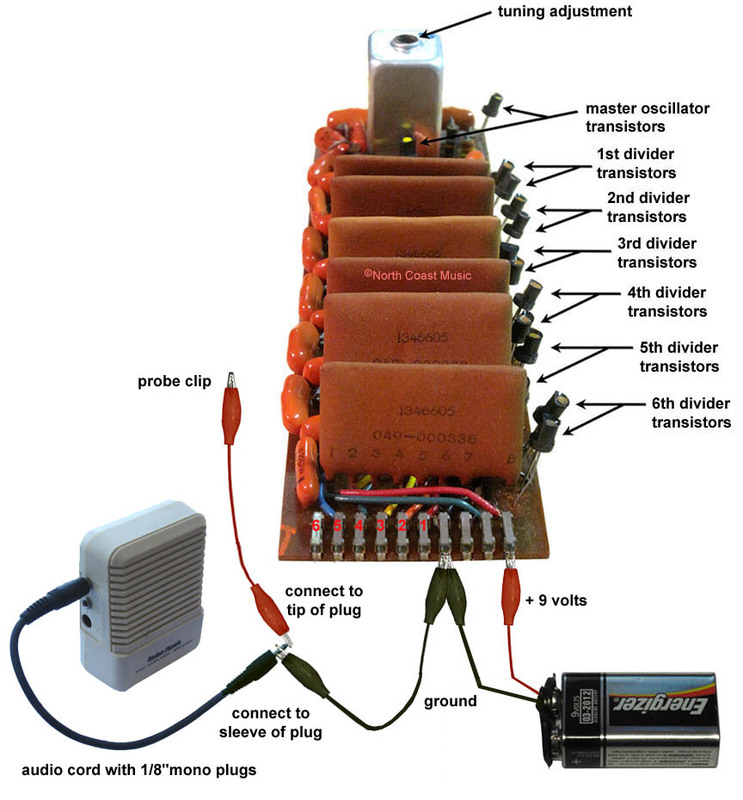 "B" tone generator card (see "B" on side of tuning coil case). If your V301H Vox "American" Continental is missing tones, chances are you have a problem with one of the six divider circuits found on each tone generator card. Even if you have no test equipment, this web page is designed to help you diagnose, and possibly even repair this V301H Continental problem on our own. The Vox Showroom and North Coast Music accepts no reposnsibility for personal injury or damage to property while using this information to attempt an organ repair. Proceed at your own risk. You will need the three Radio Shack items shown at left plus a 9 volt battery and a mono audio cable with 1/8" plugs to diagnose this problem. First, turn on the organ, connect to an amplifier and pull out the 16' and ~ drawbars. All the other drawbars should be pushed in. Starting with the low C, which is called "C1", test each note from the lowest to the highest key of the organ, which is called "C5". Listen for any note that seems to be an octave or more higher than adjacent notes. This symptom points to a problem in the divider circuitry. Here is an hypothetical example of a typical divider problem. When testing the organ, you find that the frequency of the "B2" tone is the same as the "B3" key. This symptom points to a defective divider on the "B" tone generator card. Start by turning off the organ and locating the "B" tone generator card in the organ. 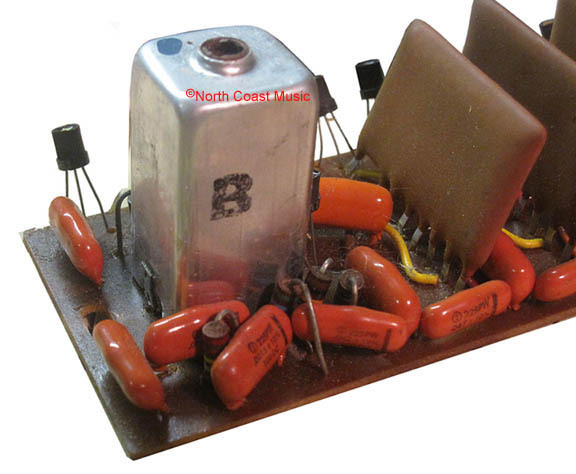 The B tone generator card can be identified by the letter "B" stamped on the tuning coil (see photo, lower left). This card will have the defective divider. Based on the hypothetical problem described above, this "B" card will have the defective divider. The tone generator will be held in place with one screw, located on the end of the circuit board near the tuning coil. After the screw is removed, gently pull the card out of the ten pin socket opposite the "screw" end of the board. Completely remove the tone generator from the organ. Carefully connect a 9 volt battery to the board, as shown in the illustration above. I use "alligator clip" leads from Radio Shack for this purpose (see picture and part number at left). The positive side of the battery goes to end pin on the right (see photo above), the negative side of the battery goes to fourth pin to from the right. Check and double check this againt the drawing before connecting the battery. Use care that you do not short the alligator clips onto adjacent pins on the tone generator. Next, connect one end of a 1/8" plug audio cord to a small battery powered audio amp, such as the Radio Shack unit shown at left (approximately $15). Connect one end of an alligator clip test lead to the sleeve of the other end of the audio cable and the other end to Pin 4 of tone generator card. This is the same pin on the tone generator that the negative wire of the battery is connected. Connect another alligator clip test lead to the tip of the audio cord. The other lead of this alligator clip lead will be your "probe" to test the dividers on the organ card. Turn on the one watt battery powered amp. Starting with the socket for the 1st divider (it has a red "1" in the illustration above) touch or probe each of the dividers with the probe alligator clip. The 1st divider will have the highest pitch or frequency. As you move through the dividers from one to six, you should hear a one octave drop from one divider to the next. In other words, the output of the 6th divider should be five octaves lower than the output of the first divider. Using the "B2" and "B3" example above. it would be likely that you would not hear an octave drop between the the 4th and 5th divider. While it is somehat possible that there is a bad capacitor or resistor in the divider circuit, it is more likely that the transistors may be bad on the 4th divider. Replace both transistors on the 4th divider, referencing to the drawing at at left, and recheck the organ. If it still doesn't work properly, you may also need to change the transistors on the 5th divider. What transistor do you need? The orange dotted transistor is a 2N2923, and the yellow dot transistor is a 2N2924. You may replace either with an NTE85 transistor, available for about $1 each from such suppliers as www.mouser.com or www.newark.com. Transistors have three leads - base, emitter, and collector. When replacing, these must be installed in the correct order. You might want to purchase the recent North Coast Music remastering of the Vox V301H schematic to help you, click here to purchase this from North Coast Music.